My Very First Blog: Welcome To Malaysia! Malaysia – truly Asia. There’s so many things to love about my beautiful country Malaysia. We have great food, great weather, great places to visit and most importantly, great people with unique cultures and traditions which you can hardly find anywhere else! There’s really no place like Malaysia! If you are non Malaysian, and have never visited my country, let me welcome you to Malaysia. Log onto Tourism Malaysia official site and start planning for your trip because I guarantee you won't regret it! 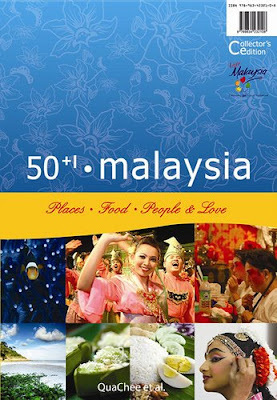 Now fellow blogger QuaChee has written a new book called 50 + 1 Malaysia (see cover photo below) which will be released for sale on the 31st July 2008. Priced at RM51, it will be packed with information and photos on my beloved country. But guess what? Bloggers can get the book for free! This contest is open to international bloggers too. So if you are non Malaysian but have visited Malaysia before, and fell in love with the country, don’t hesitate to join in! But hurry, this offer is limited to only 100 bloggers! Once I get my hands on this book, I will post a review, so stay tuned. A friend emailed me this but I am not sure if I want to join the contest but having the book would be a bonus. Thanks for the drop! Great! Thanks for sharing, this would definitely a good book to have. I would like to add, instead of great foods and culture, we have great government with lot of drama series, lot better than HK drama. hehe..
To Eat Or Not To Eat After 8pm?